Smartsheet is a collaborative work management platform that enables users to manage their work their way, thereby freeing them up to do what matters most. 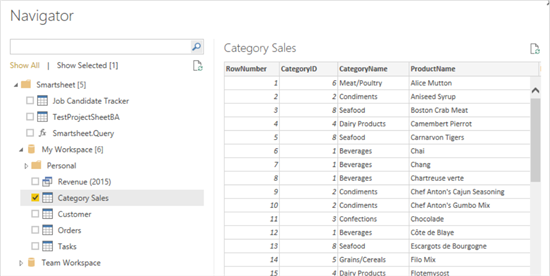 To make it even easier to gain valuable insights from your work, you can now use Power BI and the Power BI Desktop to connect to and visualize your Smartsheet data. The Smartsheet connector in the Power BI Desktop allows you to access your Smartsheet data including your sheets and reports, so you can build interactive reports to make your work more efficient. The Power BI content pack for Smartsheet gives you a comprehensive view into your Smartsheet environment, including how many artifacts you have, who your top users are and more, to help you understand how your organization is collaborating on work. This post will provide you with an overview of how you can visualize your Smartsheet data using Power BI. For additional details on how to get started, please see the help page for the Smartsheet content pack or the Power BI Desktop. 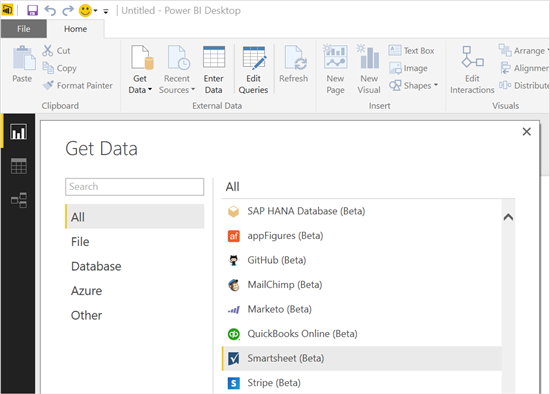 Install the latest version of the Power BI Desktop to connect to your Smartsheet data. Once installed, you’ll see the beta Smartsheet connector in the Get Data dialog. After providing your credentials, you’ll see a list of all the workspaces, folders, sheets and reports you have access to. Select one or more sheets or reports to import into your dataset. You can choose to edit your tables and use any of the wide range of transformation functions we have available. Once you’ve connected to your Smartsheet data, you can use any of the capabilities in the Power BI Desktop to shape your data and build great reports. 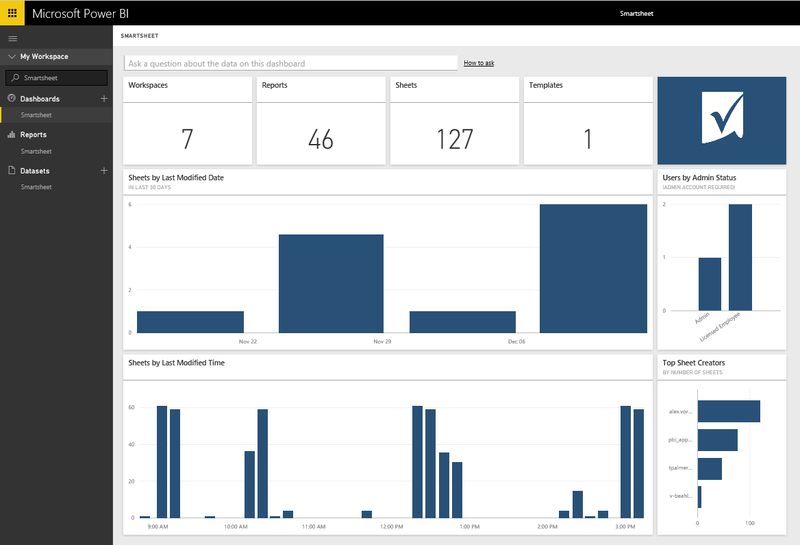 Use the Publish to Power BI feature to bring that same content into a Power BI dashboard and use Scheduled Refresh to keep it up to date. In addition to the Power BI desktop, the Smartsheet content pack for Power BI helps users get an out of the box dashboard for their Smartsheet environment, that they can further customize and see activity across the account. 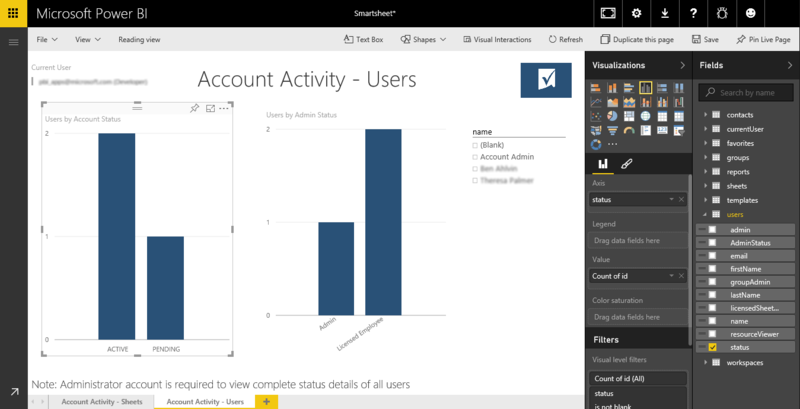 Start loading the content pack by connecting to your Smartsheet account in Power BI. A dashboard, report and dataset will automatically be created allowing you to explore further. Select any of the tiles to drill into the report and use the named tabs at the bottom to navigate. You can hover over any of the visualizations for details or select a values will cross filter the other visuals. The report can also be moved into Edit Mode which allows you to add filters, create or modify visualizations and add new report pages. These visuals can be pinned to your existing dashboards along with any custom content you create as well, ensuring all your data is in a single place. The Smartsheet content pack and the connector allows you to visualize and explore your Smartsheet data in Power BI. We’re always interested in hearing your feedback; please contact us at http://support.powerbi.com to let the team know how your experience was and if there’s anything we can do better. We look forward to your feedback!